I have a confession to make. I didn’t think Turkey would beat Albania. In fact, I thought they would struggle. After nearly a decade of total and utter disappointment culminating with hitting rock bottom under Mircea Lucescu expectations were not exactly high. Senol Gunes lead Turkey to a 2-0 away win over Albania followed by a 4-0 home victory against Moldova at the Eskisehir Stadium in the opening two UEFA European Championship Qualifying Group H games. It was the first time since Gunes guided Turkey to 3rd place in the 2002 World Cup that I have actually enjoyed watching the national team play. A cynic would say Turkey did not exactly beat heavyweights of European football. But it was the manner of victory that really stood out. The Red-Whites headed into the Albania clash having won just one of their last eight games. Watching the national team had turned into torture. Self-inflicted punishment. Stress, tears, pain. It’s been a painful decade for Turkish football. What made matters worse was that Lucescu had a pretty strong squad at his disposal. Turkish youth development has gone through something of a revival following investment in academies and the lifting of the foreign player restrictions. Foreign player restrictions were lifted in 2015. Super Lig clubs simply have to have 14 Turkish players in the squad. Football does not care about nationality. Meritocracy prevails in the sport. When you give players special privileges based solely on their ethnicity it ends up being self-destructive. Mediocre Turkish players were paid astronomic wages. With limited competition, the players had no reason to develop. There is no point in trying to better yourself when nobody can take your place. To cut a long story short, the failed policy set Turkish football back a decade. Since the lifting of the restrictions, Turkish clubs have started investing in their academies and youth coaches. Altinordu proved to be the catalyst after the likes of Cengiz Under and Caglar Soyuncu started being churned out at their football factory. All of a sudden domestic clubs woke up and realised they are sitting on a potential goldmine. 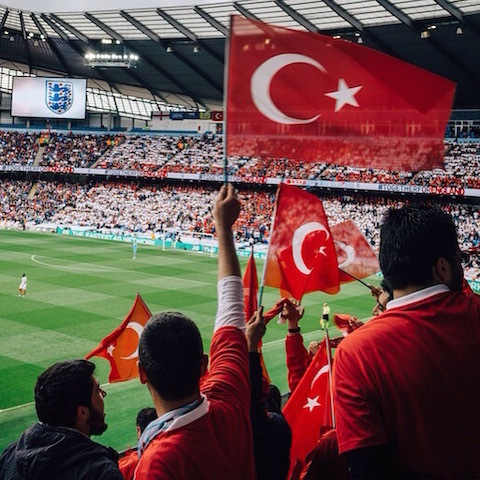 Turkey has a population of 80 million with the youngest population in the UEFA zone. Football is the number one sport. It’s not rocket science. Since 2015 14 Turkish players have moved to Top 5 European leagues netting €86m. The likes of Mehmet Zeki Celik and Caglar Soyuncu moved directly from the Turkish second-tier Lille and Freiburg respectively. Ozan Kabak was snapped up for €11m from Stuttgart just six-months after breaking out from the Galatasaray academy to the first-team. Twenty-one-year-old Merih Demiral moved from the Fenerbahce reserves to the Portuguese third-tier before Sporting Lisbon recognized his potential. Serie A outfit Sassuolo shelled out €7m for him in January. Kaan Ayhan is making waves at Fortuna Dusseldorf. For the first time in recent memory, Turkey actually have the makings of a really strong defence. Do not be surprised to see the likes of Demiral, Kabak and Zeki Celik move to top clubs over the next few seasons. All three are really special talents. And then there is Soyuncu who joined Leicester City on a £20m move this summer. He hasn’t really been given a chance yet at the Foxes but his time will come. I’m confident he will prove himself in England. The one area that could do with improvement is the left-back position. And that’s just the defence. Turkey has never had a shortage of midfielders. What has impressed me is how much Okay Yokuslu has developed at Celta Vigo. His technical ability, passing and awareness has improved as you would expect it to in Spain. There aren’t many 1.91m tall central midfielders with his skillset. I would not be surprised to see him receive a few offers this summer. Hakan Calhanoglu looks reformed after sorting out a few domestic problems he was going through. Besiktas sensation Dorukhan Tokoz is a player to keep a close eye on. He cost the Black Eagles just €300K from Eskisehir but already looks like one of the bargains of the season. Gunes opted to bring in some experience to the side. In-form midfield maestro Emre Belozoglu may be 37 but boy has he still got it. The team lacked leadership and to be fair Belozoglu, Burak Yilmaz, Gokhan Gonul and co provide a balance between old and new. Cenk Tosun looked pretty lively up front. Making you wonder why Everton haven’t made more use of him. Gunes still has the likes of Valladolid striker Enes Unal and Besiktas froward Yalcin Guven to call on. He could even promote Ahmed Kutucu from the U19 national team. The Schalke attacker has really impressed me and Turkey should not miss out on giving him a cap before Germany convince him to represent them. There is also PSG rising star Metehan Guclu. Altinordu and Galatasaray continue to churn out young talent. Oh and Roma starlet Cengiz Under wasn’t even in the squad due to injury. There are really exciting players coming through the ranks of the youth side that I expect to be integrated into the first-team at some stage over the qualification stage. Gunes has only been in charge of Turkey for two games but he has invigorated a side that looked devoid of confidence and self-belief just a few weeks ago. For the first time in years Turkey played aesthetically pleasing football. Gunes has always been an attack-minded coach who values a high-press and technical, fast-paced football. The national team were a joy to watch against both Albania and Moldova but the defending also deserves praise – which makes a change. Goalkeeper Mert Gunok has conceded just 14 goals in 30 games across all competitions this term. His clean sheet against Moldova was his 18th of the season. It is important not to get too carried away. Turkey take on France next who are going to be Gunes’ first real test. The reigning World Cup champions are clear favorites to top the group. Success for Turkey would be finishing ahead of Iceland as runners-up.